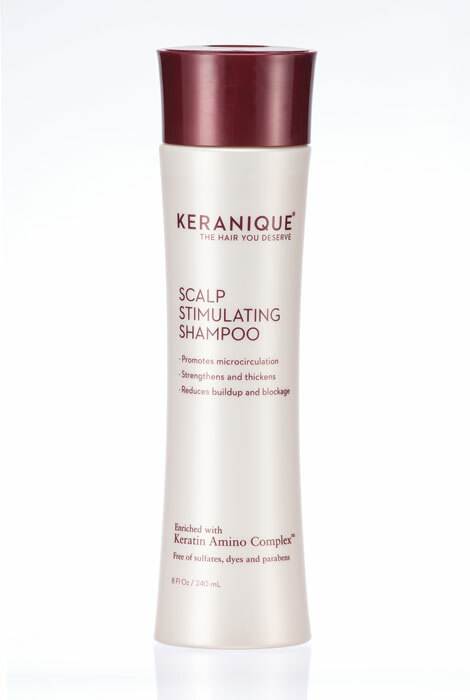 Keranique® Revitalizing Shampoo for Thinning Hair gently and deeply cleans and stimulates the scalp to nourish and rejuvenate hair follicles, leading to improved hair growth. Fortified with Keratin and Pro Vitamin B5, the shampoo leaves hair ultra clean, retains shine and protects against cuticle damage. Sulfate-free and safe for color-treated hair. 8 fl. oz. Truly adds volume to my thinning hair. I use this daily. Because of health issues and medications I began seeing a major hair loss. I began to see new hair growth within 6 to 8 weeks and continue to see a much fuller head of hair. I love this and I fell this has made my hair feel healthier,fuller and just over all great. It's a bit expensive but this my hair, call me vain but I care about how I look, and it starts with my hair. A free bottle would be AWESOME!!!! I was very happy to see that As We Change offered Keranique WITHOUT having automatic delivery. I've used one bottle so far and just order another bottle. Just received the product so have only used it three times so far but love what it has done for my hair. Will probably, even though it's expensive, will purchase again. Been using for awhile now and seen improvement. This is the best shampoo for my baby fine, barely there hair. I have tried many.Keep coming back to Keranique. Just wanted to try it, have heard good things. Tried it and it works good on very fine hair. I have been using the 'regrowth' spray treatment, and decided to incorporate the shampoo, in hope of better results. After utilizing for a few weeks, I will share my opinion/results. Makes a great Xmas gifts for daughters, nieces and granddaughters. My daughters and I use daily and love the results! I hope it thickens my hair. my hair is thinning and I got hopeful that your shampoo could help me!!! First time purchase; been wanting to try. I have fine thinning hair and I'm hoping this will help to correct my situation. Great shampoo, one of the best! Already using this shampoo and I like it! I love the way it cleans my scalp and makes it feel tingly. my hair is so thin that I will try anything! Desparate for help for thinning hair! These make wonderful gifts at Xmas. All of the women in my family love the way their hair looks using Keranique shampoo and conditioner. I tried a sample of the shampoo and loved what it did for my hair - fuller, thicker, with a lot more bounce! When I used this product, I didn't lose any hair in the shower as I did with other shampoos. My hair has been thinning for the last couple of years and I want to see if this will help. My hair is thinning and falling out and this shampoo is supposed to help. Gives my hair shine and body. Works wonders on thin hair. To get my hair to grow. Ii get my hair colored to cover grey. Will this take out the color? Hopefully your experience will be better...Good luck. No, it just helps with thinning hair. I had no problem using this product. I DON'T COLOR MY HAIR. Is there an ingredient in this shampoo that affects your heart? BEST ANSWER: Thank you for your question. Unfortunately we do not have that information. You may be able to get information from your doctor. We hope this information will be of help to you. Do I have to use automatic delivery when ordering Keranique shampoo? BEST ANSWER: Thank you for your question. You do not need to join the automatic delivery to purchase. You can order as a one time and order when every you may need it. We hope this information will be of help to you. I have thin hair. Can I pay with a Master Card?